5793 labyrinths found. Showing 181-200. Sorted by country, state, city, then zip/postal code. Inquire at the front desk about the current location of the coin (and if it is on display). There is a postcard of the coin in the gift shop. The labyrinth coin can be viewed whenever the museum is open. Daily 10 a.m. to 6 p.m.
Thursday 10 a.m. 10 p.m. Please enquire as to which collections are partly or wholly closed because of renovations. This labyrinth can be found on the ground floor, very near to the Egyptian artifacts area. 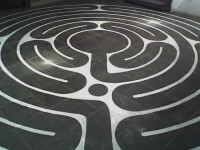 A postcard of the labyrinth is often available in the gift shop. The labyrinth can be viewed whenever the museum is open. Daily 10 a.m. to 6 p.m.
Tile mosaic labyrinth installed as a museum exhibit. There is a bit of a light show that highlights different areas of the labyrinth. The labyrinth painted on the floor of the Freeport Art Centre, illuminated with candles. Claudette Dean's 'Lumiere' art-exhibition adorn the walls surrounding the labyrinth. Located on the floor of a Gallery Room inside Freeport Arts Centre. Telephone for details. Call Gallery first for hours and availability as well as scheduled events. Inside the Garden Of The Groves, entrance off Magellan Dr. between Sunrise Hwy and Midshipman Rd. On Saturday 1st May 2010 ‘Walk as One at One’ on the Grand Bahama Labyrinth in the Garden of the Groves, Grand Bahama Island. Peaceful Open Walk in a beautiful Tropical Garden Park. Commune with Mother Earth and all Creation. Everyone welcome. This year’s walk will be led by Darren Rollins. Located 10 km from the M1 motorway (Minsk - Moscow), turn from M1 to P25. 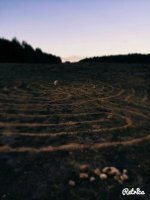 The labyrinth is located 5 km from the nearest village on the edge of the forest. Located 20 meters from the natural spring water. The place itself has a powerful energetic. 6 E° Lat. ; 50,13 N° Long. Located in the Pacification Room of Gent Town Hall, off the main square in the city centre. The labyrinth is usually partly covered in chairs and carpet, but can be partially viewed on guided tours of the Town Hall. A new maze every summer! 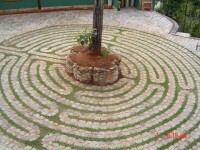 A Chartres labyrinth used by the students during lessons and in their freetime. Situated on the floor of the church, just inside the main doors. The labyrinth is often covered with chairs at weekends, but often uncovered during the week, subject to special events and services, etc. An unusual square labyrinth, design probably inspired by St. Omer. St. Huibrechts-Hern is a small village 6 km north of Tongeren, north-west of Liege. The labyrinth is carved on a block of stone set into the exterior south wall of the church tower. Next to the church in the centre of the village. Open for the workshops of ARTEVIDA. My wife and I built the labyrinth walk as part of our Bed & Breakfast. We are in a special environmentally protected zone of the Atlantic Rainforest (Mata Atlantica) adjoining a 6,000 foot mountain, one hour north of Rio de Janeiro international airport via superhighway BR-040. 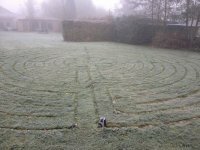 The labyrinth walk is available for our guests. Inspired by our visit to the labyrinth at the Museum of the American Indian in Santa Fe, New Mexico, our labyrinth is a Chartres-style 11-circuit labyrinth with classic rose formation in the middle. We built it around a 60-foot tree, which forms the center of the labyrinth. The labyrinth looks up to a steep mountain peak and a forest area. 15 49'27" S° Lat. ; 47 55'45" W° Long.